There are a million reasons why New York is a charming city--like the way that if you're having a crappy day, the right train comes without delay and lifts your spirits. Or your bartender forgets to charge half your drinks, or you find a metro card with $40 on it, or the pouring rain starts as soon as you are safely inside. I could go on and on about reasons why I love this city, from the beauty in changing seasons to the interesting people you'll undoubtedly meet along the way. But what I'd rather show you, is the charm of the streets. 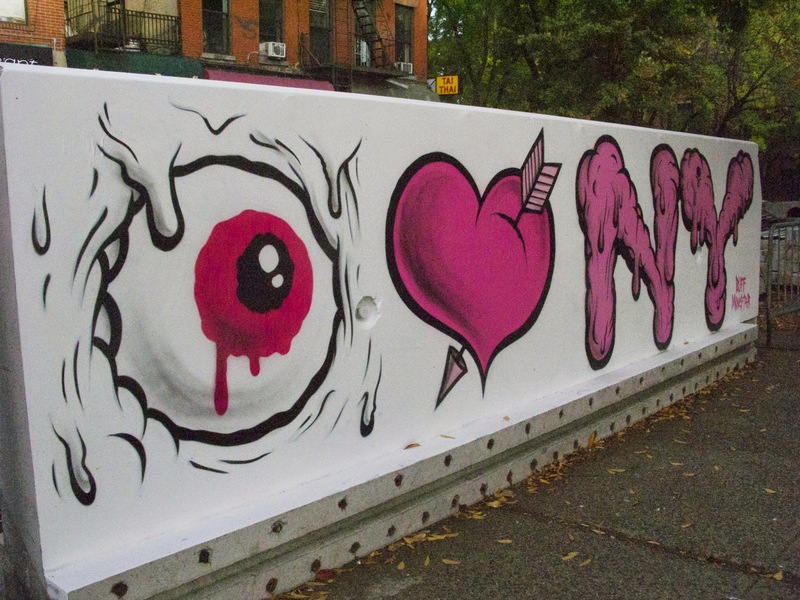 Among all the promotion we see in the streets, from brand advertisements to inspiring "dream big" messages, politically charged statements or New York survival tips, my favorite of them all has to be the iconic, I <3 NY. It really never gets old (except for the tourist t-shirts. Those are annoying). 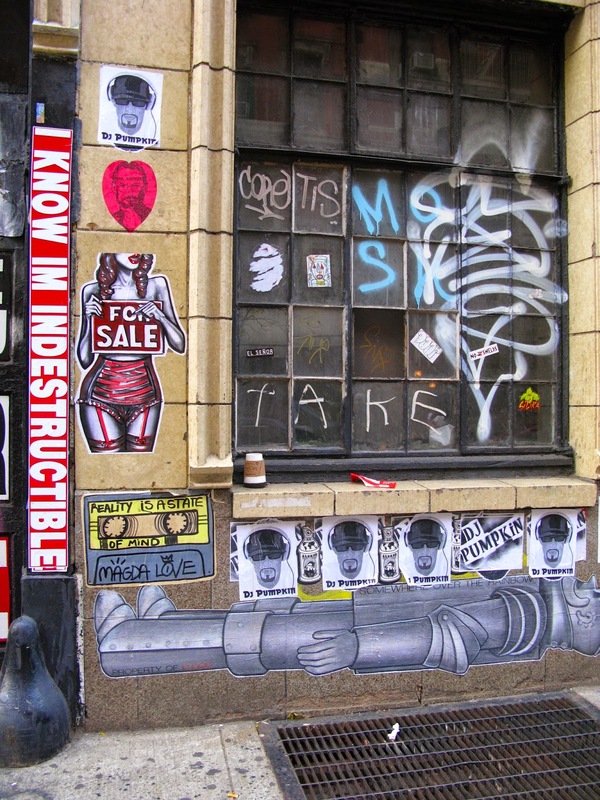 So naturally, I love this new piece by Buff Monster on Houston and E 1st St. 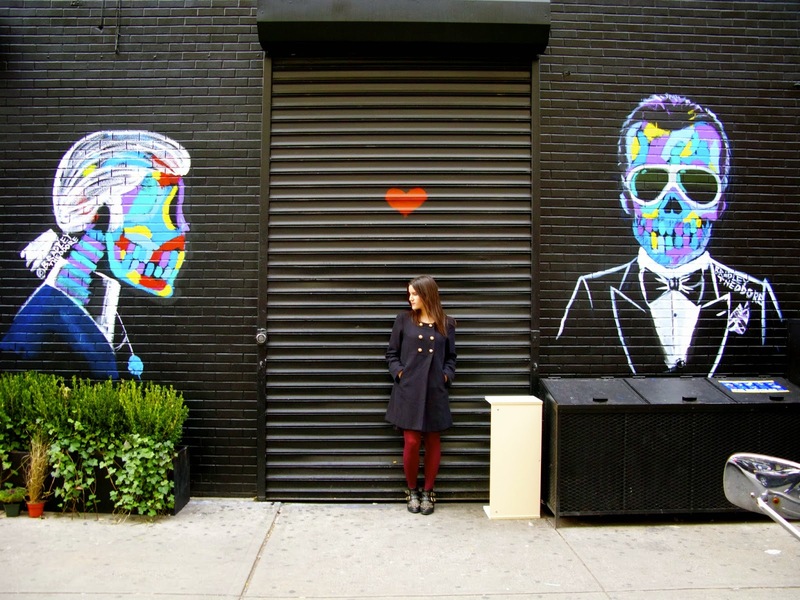 This traffic jam of a corner connecting the Lower East Side and East Village is a little street art haven, most popularly showcasing the Centre-Fuge Public Art project. Also made for Centre-Fuge is this funky concrete wall by Elle and the London Police. 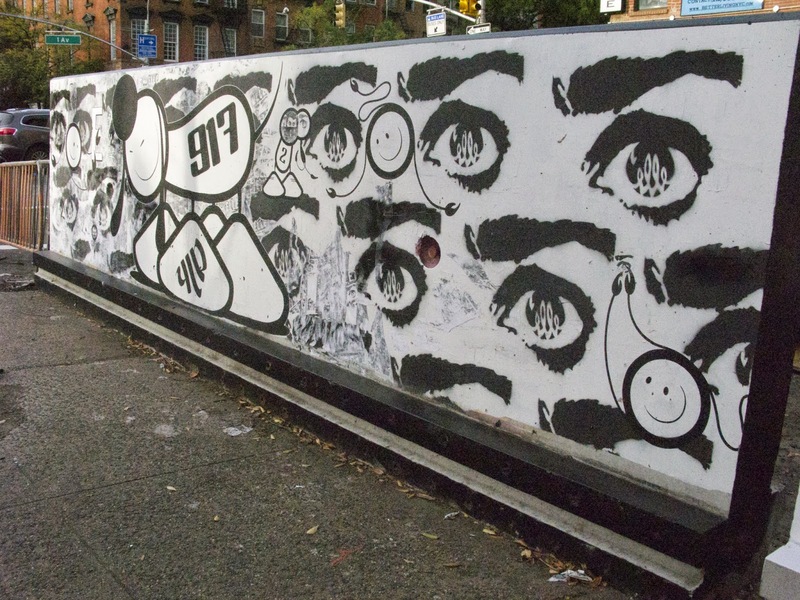 Even though it's black & white, it's not missing any of the energy of a colorful mural. Love it! As we make our way into the East Village from E 1st St, another type of New York charm emerges. 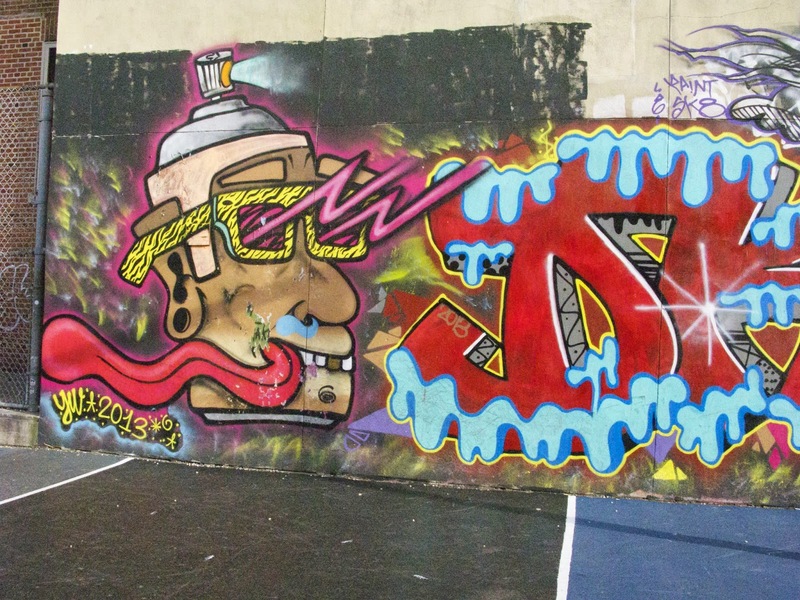 As on many basketball court walls and high school buildings, a giant space for graffiti and street art alike. 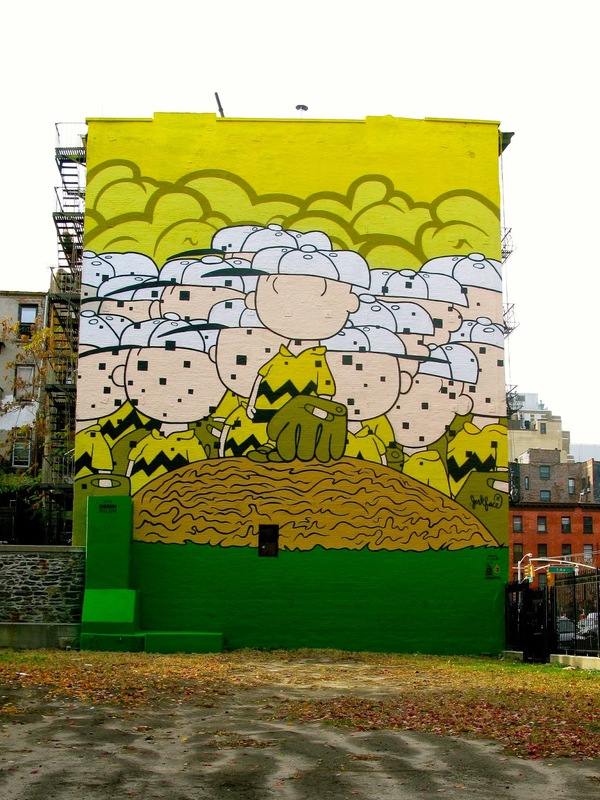 The newest in the neighborhood, and most glorified for its' size and nostalgic fun, is this Charlie Brown piece by JerkFace. Rising 6 stories (60 feet!) up on the backside of East Community High School, this mural is a perfect example of the positivity and charm that street art can bring to a city. 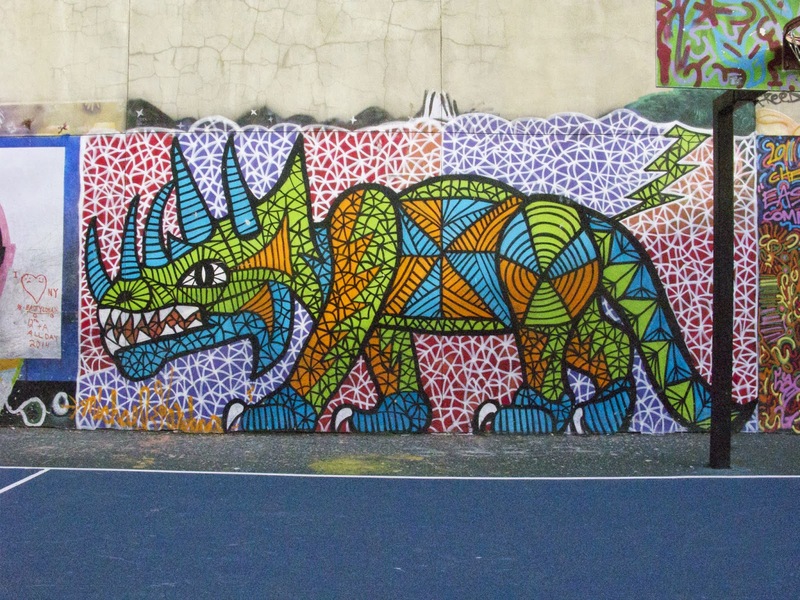 The wall was sponsored by Wat-aah!, with their project "Taking Back the Streets" that promotes drinking water and maintaining a healthy lifestyle to kids. They're able to reach people, well, because it's kind of hard to miss. And it's cool, and kids like it, and hopefully therefore they will be more likely to drink water than soda! 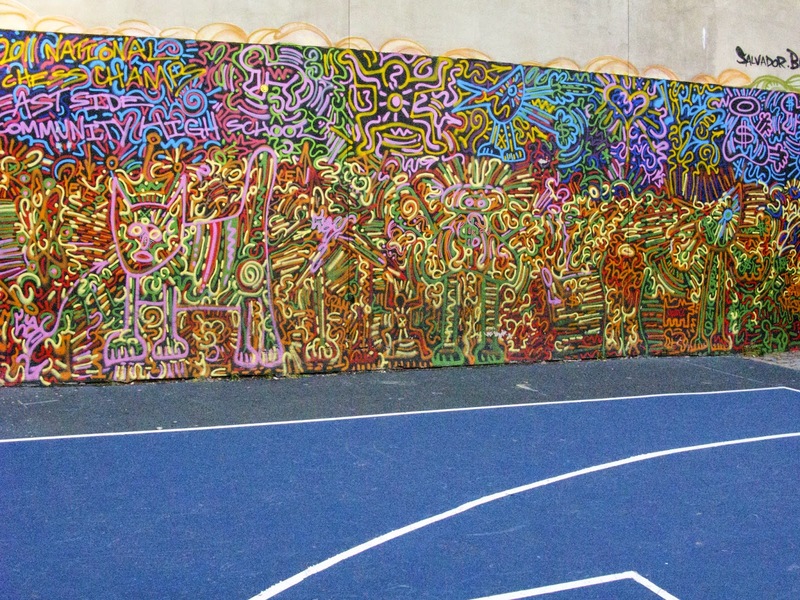 Also in the back of the high school, is the community basketball court, which dons its own, more weathered art. Though no one was actually playing basketball this particular morning, there were a few skateboarders coming in and out. The detail and bright colors make this court truly beautiful, and now with JerkFace across the street, this backyard of the East Village now looks complete. Take a look around! With the Lower East Side just back down 1st Ave, and hundreds of options for lunch spots in that direction, we turned around and headed south again. 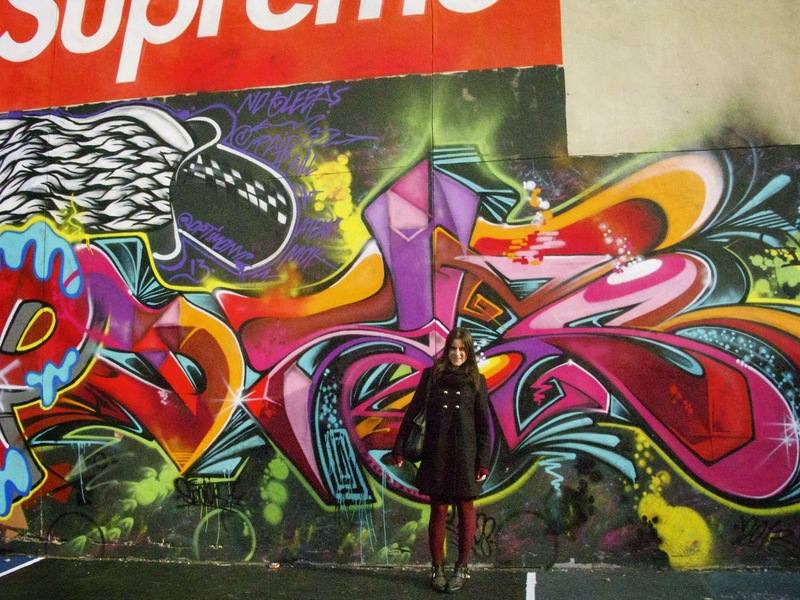 Along the way, we find a graffiti and wheat paste hotspot. 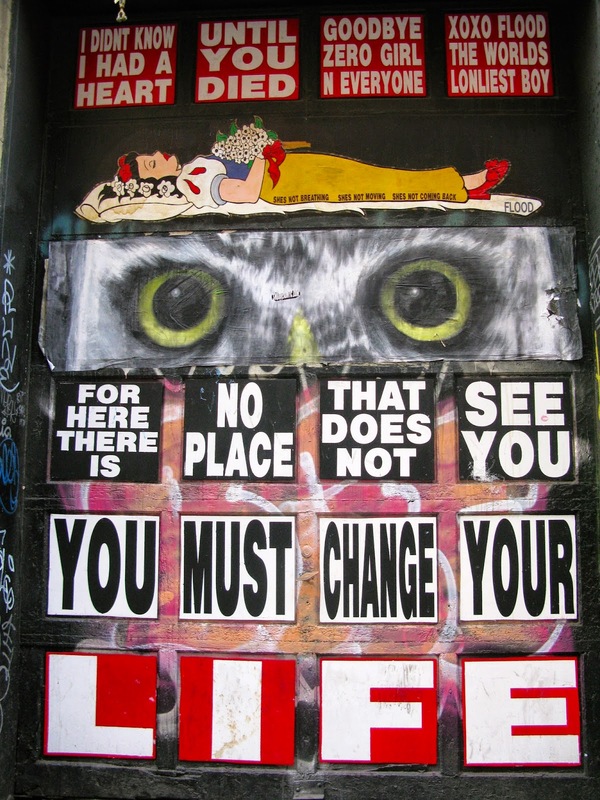 From reminders that "reality is just a state of mind", to a Snow White paste-up, and words of wisdom from an owl's eyes, there's so much to take in. Less than five feet from me taking these pictures, by the way, was a homeless guy peeing into the gutter. Take a breath---it's all part of the charm. Aha. And now, for the grand finale. 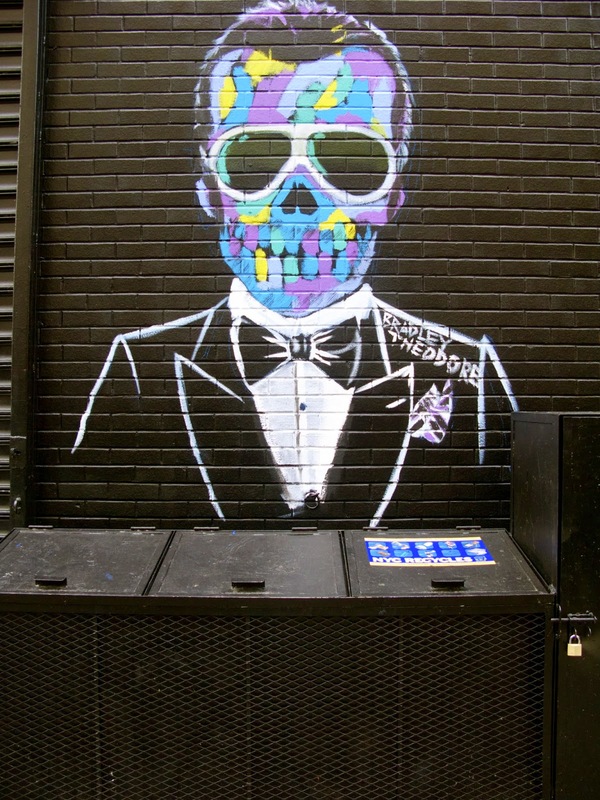 Where the streets of New York truly showcase a mix of art and fashion, and in an all-black-everything, edgy sort of way. Downtown street style, as it is in its most creative charm. Karl Lagerfeld + Tom Ford, in stark comparison to the jet black walls and the heart on the rolling gate. 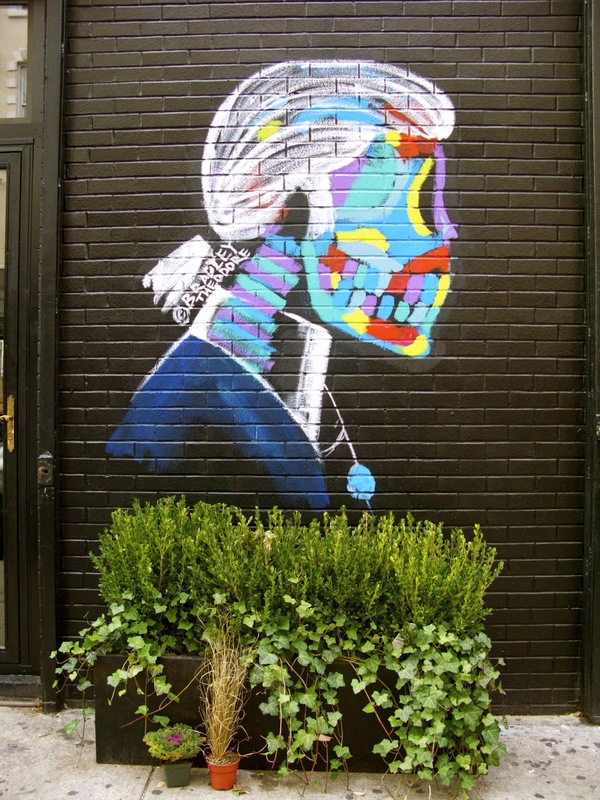 This iconic New York street style piece is by the only & only Bradley Theodore. He's now on a Eurotrip getting inspiration for his next pieces, so this is what we have to savor until something new comes along. 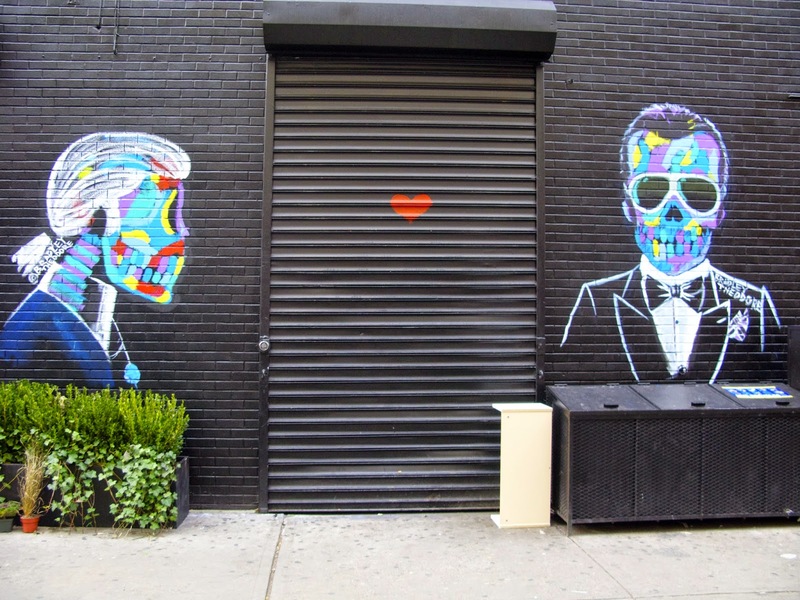 It may be my favorite Bradley Theodore yet, and I can only hope that it stays on the unassuming corner of Ludlow and Rivington forever. If not, it's at least immortalized on my Instagram!